County Louth (Irish: Contae Lú) is a county in Ireland. It is in the province of Leinster and is part of the Border Region. It is named after the village of Louth. Louth County Council is the local authority for the county. The population of the county is 122,897 according to the 2016 census. 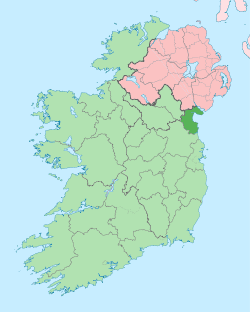 County Louth is colloquially known as 'the Wee County' as it is Ireland's smallest county by area (826 km2 (319 mi2). It is the 18th-largest in terms of population. It is the smallest of Leinster’s 12 counties by size and the sixth-largest by population. Despite its fairly average total population, Louth is the second most densely populated county in Ireland behind Dublin, and the fourth on the island of Ireland, due to its small size. The Normans occupied the Louth area in the 1180s, and it became known as 'English' Oriel, to distinguish it from the remainder ('Irish' Oriel) which remained in Irish hands. The latter became the McMahon lordship of Oriel of Monaghan. In 1189 AD, a royal charter was granted to Dundalk after a Norman nobleman named Bertram de Verdun erected a manor house at Castletown Mount. Later in 1412 , a royal charter was granted to Drogheda. This charter unified the towns of Drogheda-in-Meath and Drogheda-in-Uriel (Louth) as a County in its own right, styled as ‘the County of the town of Drogheda’. Drogheda continued as a County Borough until the setting up of County Councils, through the enactment of the Local Government (Ireland) Act 1898, which saw all of Drogheda, including a large area south of the River Boyne, become part of an extended County Louth. The 16th and 17th centuries featured many skirmishes and battles involving Irish and English forces, as it was on the main route to 'the Moiry Pass' and the Ulster areas often in rebellion and as yet uncolonised. Oliver Cromwell attacked Drogheda in 1649 slaughtering the Royalist garrison and hundreds of the town's citizens. 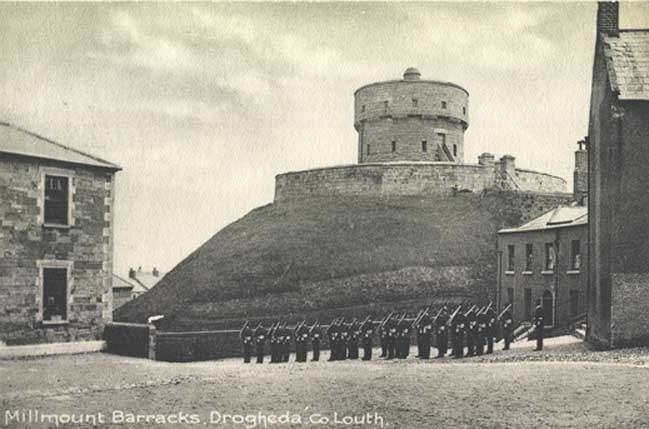 Towards the end of the same century, the armies of the warring Kings, James and William, faced off in South Louth during the build-up to the Battle of the Boyne the battle was fought 3 km west Drogheda. Drogheda held for James II under Lord Iveagh, but surrendered to King William (III) of Orange the day after the battle of the Boyne. County Louth is the 19th largest county in terms of population yet it is the most densely populated county in Ireland outside of Dublin with a population density of 148.7 people per km², almost double that of the national average. The majority of the county's 122,897 population live in either Dundalk in North Louth, or Drogheda in South Louth. The 2011 Census confirmed Drogheda and Dundalk as not only the largest towns in the county, but also the largest and second largest towns and overall 6th and 7th largest urban areas in Ireland. For elections to Dáil Éireann, Louth is represented by the five member Louth constituency which takes in the entire county of Louth and two electoral divisions in County Meath. the Electoral (Amendment) Act 2009 merged the electoral divisions of St.Mary's (Part) and Julianstown, collectively known as "East Meath" in County Meath with County Louth to form one Dáil Éireann constituency. The Report on Dáil and European Parliament Constituencies 2007 outlined "by extending the constituency southwards from, and in the environs of, Drogheda and taking in electoral divisions which have extensive linkages with the town. This will allow the inclusion of the town of Drogheda and hinterland areas in a single constituency." This merger allowed the areas of the Greater Drogheda area in County Meath and their combined population of 20,375 to be merged with Drogheda and County Louth. Following the 2011 general election, the constituency elected two TDs for the Fine Gael party (centre right), and one touchdown each for Fianna Fáil (centre to centre-right), the Labour Party (centre left) and Sinn Féin (left wing). 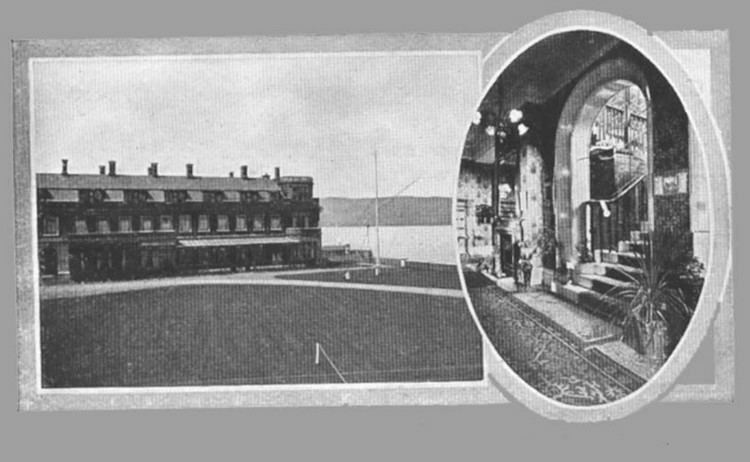 The area of Omeath was Irish-speaking until the early 20th century. A native dialect of Louth Irish existed there until about 1930, but is now extinct, although recordings have been made. Within the county 1,587 people use Irish on a daily basis outside of the education system according to the 2011 census.